So what are opercular bones and otoliths? The operculum, which includes the preopercular and opercular bones, is a series of bones found in bony fish that serves as a facial support structure and a protective covering for the gills; it is also used for respiration and feeding. 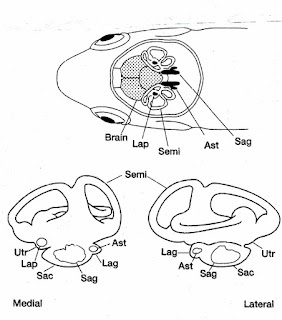 Otoliths are a calcium carbonate structure in the inner ear of vertebrates. They act as gravity, balance, movement, and directional indicators in all vertebrates, and have a secondary function in sound detection in higher aquatic and terrestrial vertebrates, including fish. 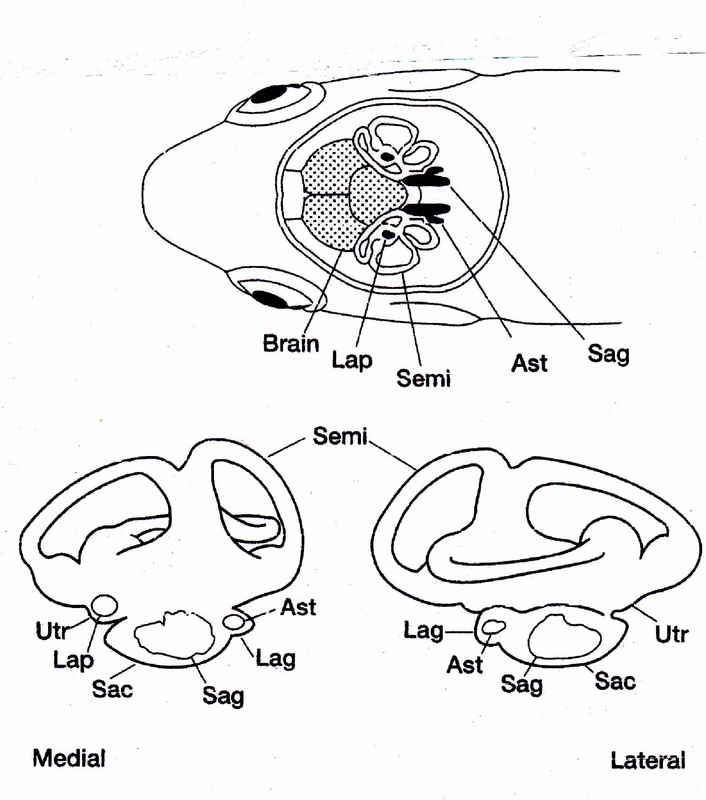 Vertebrates have three pairs: the astericus (Ast), lapillus (Lap), and sagitta (Sag). Many fish can be identified to genus and species by their sagittal otoliths but alas, we found only one! At least we had several opercular bones. While we couldn't use them to determine genus and species, they could determine the size of the fish the eagles were bringing in. Several papers document a close relationship between the size of the opercular bone and the total length (from nose to tail) of the fish. I chose Hostetter and Munroe's 1993 paper Age, growth, and reproduction of Tautoga omtis, which used the formula log10 TL = 1.2916+0.860 log10 OR for males. The paper meticulously documented Hostetter and Munroe's methodology and results, which were used in subsequent studies of several fish species. It was also well-cited and required nothing more than a dial calipers, intact opercular bones, and a good calculator - three things I had on hand! Opercular and preopercular bones of our largest fish. I ran my measurements through the formula log10 TL = 1.2916+0.860 log10 OR to obtain the lengths below (more on that at the end of the blog). While we collected 17 bones, only 14 were intact enough to use. 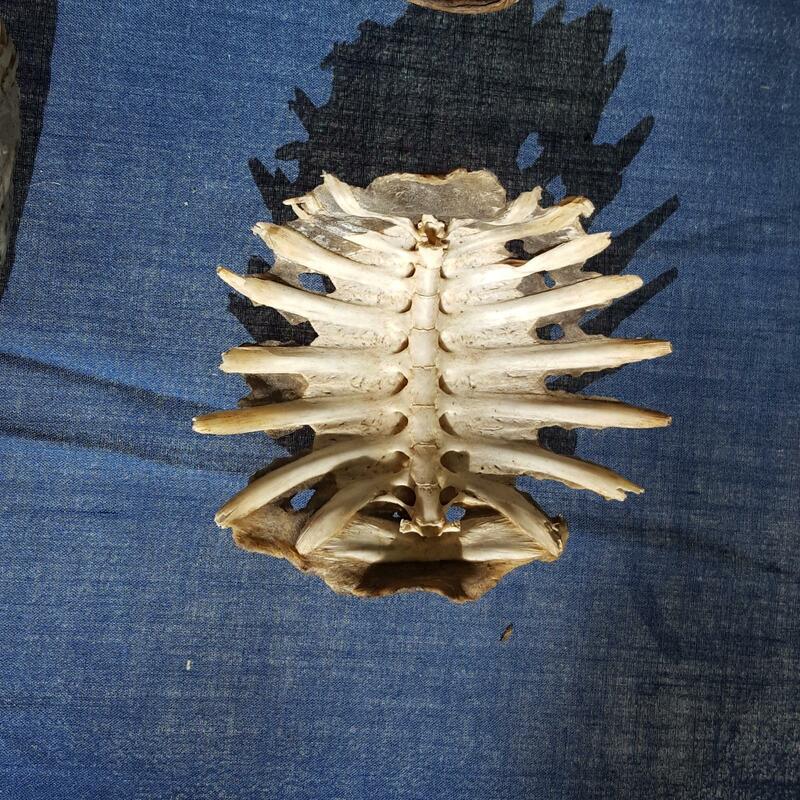 In addition to sizing fish, opercular bones can also be used to age fish. Like trees, they produce annular rings that can be counted once the bones have been cleaned and held up to a strong light. However, I was confused by the age of my fish. Almost every opercular I counted yielded an age of four or older, with several between six and nine years of age and the oldest (the outlier) about fourteen. I hadn't expected my fish to be as old or as big as they were. Was I counting wrong? What was going on? Operculars. Mr. Big is at left. It was the oldest and the largest opercular bone. As eagle cam watchers might recall, sucker fish rise in the spring and early summer to spawn on gravel beds and sand bars. Every year, Dad Decorah and Mr. North haul in suckers by the dozens once the run starts, sometimes bringing in more than one at a time! However, Longnose Sucker don't become sexually mature until they are between five and nine years of age, while White Sucker don't reach sexual maturity until they are three to eight years old. This means that spawning suckers are a minimum of three years old at spawning, and could easily be older. Finally, my large old bones make sense! Do we know that these fish are suckers? No - but age and size as determined by the opercular bones fit the species, especially given the presence of suckers as identified by local fishing guides, their age at sexual maturity, the amount of sand and gravel bars in the area, and the seeming preference of eagles for suckers when given the choice between suckers and, say, trout. Bob would love this, since he theorized back in 2012 that sucker fish spawning could be the Midwest's equivalent of a salmon run when it comes to protein sources for eagles and other animals that eat them. We'll be watching closely during the spawning season in 2018 to see if we can identify the fish that Ma and Pa FSV bring in! (Amy's note: There were two very distinct shapes of opercular bone, which makes me think that at least two different species were brought into the nest. One was rounded [Mr. Big and several of the others], while the other was more angular). Of course, fish weren't the only aquatic animal the eagles brought into the nest. We also found three turtle shells. Alan Resetar, the McCarter Collections Manager for the Chicago Field Museum's Amphibian and Reptile Collection, identified them as spiny softshells (Apalone spinifera). This was very helpful, since I originally thought they might be western painted turtles or small snapping turtles. He also provided a link to this guide for identifying turtle shells and remains: http://fieldmuseumlibrary.worldcat.org/title/turtle-atlas-to-facilitate-archaeological-identifications/oclc/35793760. Take a look at the picture below, which clearly illustrates how the spine and ribs are fused to the shell, giving turtles their distinctive walk. So what did we learn? Collecting prey remains from the Fort St. Vrain nest gave us a couple of unexpected insights. As dry as the area is, aquatic animals (especially fish) are still an important part of Ma and Pa FSV's diet - something we didn't expect. The spiny softshells were a surprise, since they are at the extreme western end of their range. And like the Decorah and Decorah North eagles, the Fort St. Vrain eagles appear to take advantage of the spring sucker run, which comes at a very timely point in the lives of their young! While some specific prey details are different (prairie dogs! 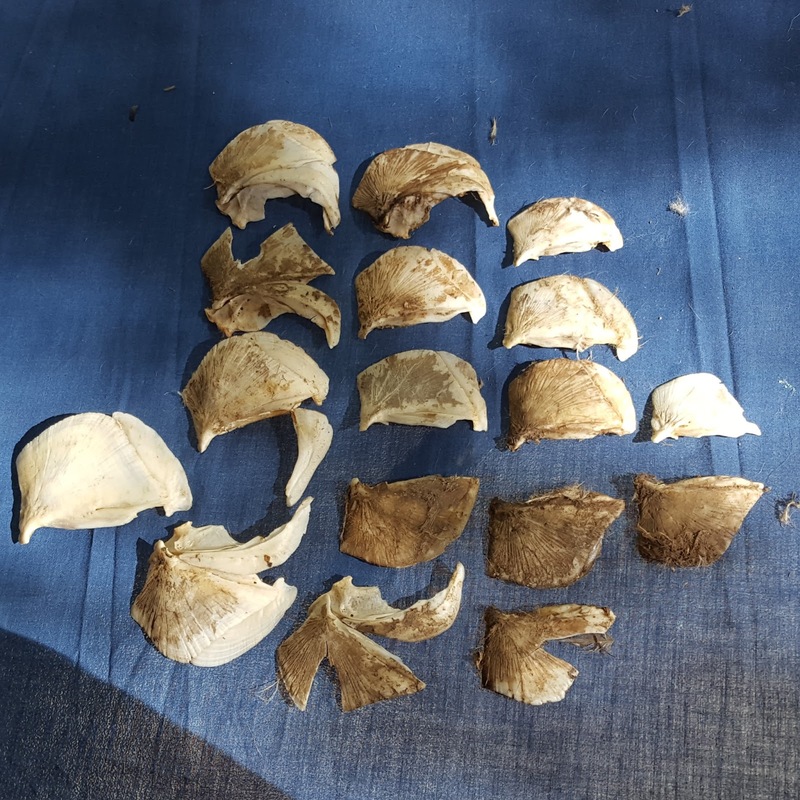 ), the remains we found fit within the larger framework of bald eagle behavior - getting the most food for the least amount of effort and risk expanded. Benjamin Franklin famously called bald eagle behavior lazy, but it takes experience and intelligence to know where and how to find food, especially in a beautiful but unforgiving place like Colorado's Front Range. Xcel Energy, thanks for all of your hard work and support. You are wonderful eagle and falcon friends, and I look forward to collecting prey remains from Fort St. Vrain next year! I was quite fascinated by this nest, which is much drier and 'stickier' than our Iowa nests. The lack of humidity means that materials don't tend to compost in the nest, although the eagles still prepare the area under the nest cup and strip bark from the sticks they bring in. We have three eagle nests to watch in Iowa and Colorado. What can we learn from their differences and similarities? We look forward to finding out! 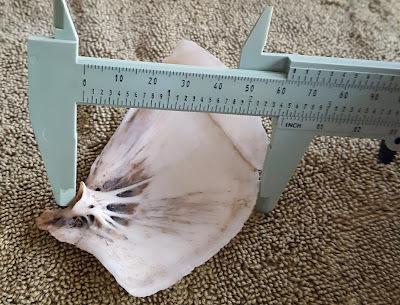 I wish we found more otoliths, since researchers are using them to model climate impacts: https://blog.csiro.au/fish-ear-bones-point-to-climate-impacts/. I am hoping to send our fish and mammal collection to the Field Museum in Chicago! Laughing Grizzly Fly Shop. Hit them up for fishing if you are in Longmont, Colorado - these guys know their business! Luke Ries. Thanks for the help on the math formula!